The physical properties of soil - including soil composition, drainage properties, pH and fertility - all affect your ability to grow plants. So it’s important to learn about them early in the process of planning your garden. Last month (October, 2012) we discussed several simple soil tests for determining the physical characteristics of your soil. If you’ve done these tests, you now know whether your soil drains quickly, slowly or somewhere in between. But how can you use this knowledge to improve your gardening success? 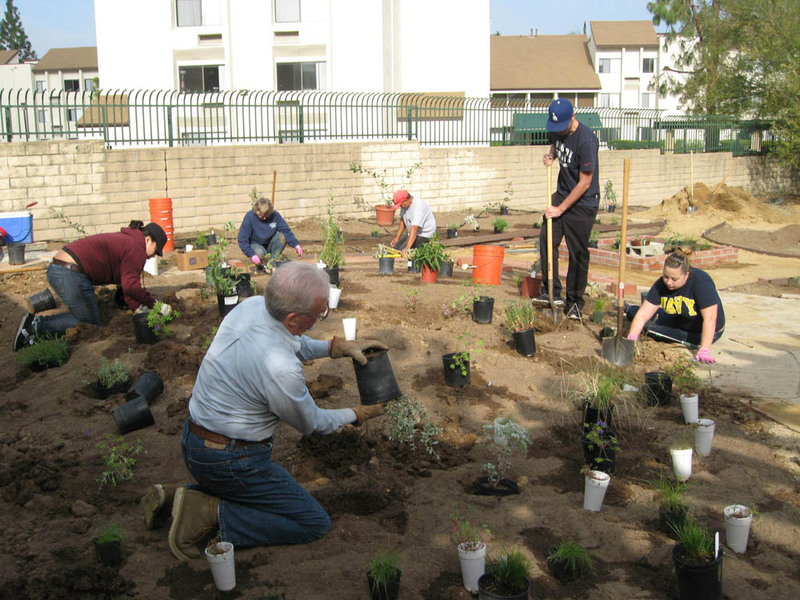 In the past, California gardeners were encouraged to amend their soils prior to planting. If your soil was slightly basic/alkali (pH 7.5-8.0 – common in our area) and you wanted to plant an acid-loving plant like an Azalea, you were advised to amend the soil with peat moss and use an acid fertilizer. If your soil was sandy, you were encouraged to add organic amendments like steer manure and compost to ‘improve’ your soil. And so on and so forth. To do its work, an amendment must be thoroughly mixed into the soil. If it is merely buried, its effectiveness is reduced, and it will interfere with water and air movement and root growth. A visit to the local gardening center can be a confusing experience; there are so many different soil amendment products available! All of them cost money and require time and effort to use. So, what’s a sensible approach to soil amendments and fertilizers? Here at Mother Nature’s Backyard, we like to garden in concert with Mother Nature. We suggest working with what you have rather than trying to change it. Consider your soil’s characteristics as assets, rather than properties that automatically need improvement. And tailor your plant choices and irrigation practices to your un-amended soil. This approach runs counter to the advice of many traditional gardeners, but we think it has merit. For one thing, you’ll save money and time. You won’t be overusing products that can contaminate the soil and ground water. You’ll also learn about a whole new set of plants – California natives for the most part – that may have grown in your soil for thousands of years. And you’ll have the satisfaction of seeing your garden grow into a small functioning ecosystem, above ground and below. Do I have to use soil amendments? The simple answer is no. The plants that do best in a garden are usually those suited to the natural soil conditions. As it turns out, it’s actually difficult and expensive to change some of the basic soil properties, like pH, using soil amendments. In the long run, it’s usually easier to plant the right plants for the soil conditions rather than the other way around. Can I amend just part of my garden? Yes – in fact that’s often a good idea. With a little planning, you can amend only areas that really need it and plant better suited plants in the rest of the garden. By grouping plants (like vegetables) in one area you can save effort while still giving each plant the soil conditions it needs. What if I want to grow a plant with very different needs than my soil provides? If possible, consider growing the plant in a large container. It’s easy to give plants the specialized soils they need in containers. Another possibility is to grow the plant in a planter or in raised beds. Once again, the idea is to group plants with similar needs so you amend only a portion of your total garden. Should I amend my vegetable garden's soil? Yes. The vegetable garden has soil requirements that are often different from the rest of the garden. Vegetables need a well-drained soil with relatively high nutrient levels. The best way to provide this is to amend vegetable garden soils with compost and supplemental fertilizer. If you have a vegetable garden you will likely want to amend it yearly. Should I amend soils in containers? The environment in containers (pots/planters) is quite different from that in the ground. Drainage and soil nutrients are particular issues. We suggest using a good potting mix (rather than garden soil) in containers. Garden soil usually doesn’t drain as well as potting mix and may contain undesirable soil organisms. You can amend the potting mix to suit the needs to the plant: more sandy, more acidic, higher nutrient levels, etc. Pots, planters and containers usually benefit from occasional to yearly addition of soil amendments or even an entire change of soil. We’ll discuss container gardening in more detail in another post. My soil drains slowly. Shouldn’t I amend it to improve drainage? Not necessarily. Clay and clay-loam soils do drain more slowly. But they also retain soil moisture, so you don’t need to water as often in the summer and fall. We know from experience in Mother Nature’s Backyard! There are plenty of plants that like clay soils, so you can tailor your plant choice to your soil drainage characteristics. And there are other things you can do to improve soil drainage. We’ll discuss these in some detail next month (December, 2012 – Improving Soil Drainage). How do soil amendments differ from mulches? Soil amendments are incorporated into the soil before planting, while mulches are spread on top of it (see July, 2012 for a discussion of Mulches). Organic mulches do decompose and change a soil’s characteristics over time. But they are not soil amendments. Should I amend soil in the potting hole before I plant a tree/shrub? What are common soil amendments? Like mulches, soil amendments are inorganic (either mined or man-made) or organic (from something living). The table below summarizes characteristics of the most common soil amendments used in S. California gardens. Cautions: the breakdown of wood products requires high levels of soil Nitrogen – need to add N fertilizer for 3-4 years after use; breakdown may release natural chemicals (tannins) which inhibit seed germination. Why used: to improve soil drainage or water retention; to improve soil fertility. Cautions: may increase soil nutrients too much for local native plants. Cautions: expensive if purchased; you can raise earthworms & create your own, but that takes space, effort. Cautions: most native plants need none (or low doses); for all plants, over-use of fertilizer can lead to excessive growth & decreased plant health/increased pests; long-term use of fertilizers can actually make soils toxic to plants and beneficial soil organisms. Use only as needed. See 'Wildflower Seeds' page on the right for more details.